Today I am going to talk about the Fortigate Next Generation Firewalls, Fortigate 7000 Series Next Generation firewalls. Fortigate 7000 includes three different models and these models are FortiGate 7060E, FortiGate 7040E and FortiGate 7030E. FortiGate 7000E series brings excellent performance NGFW security service industries product for enterprises and data center infrastructure demanding inflexible defense from cyber threats and malware, at the perimeter and in the core of the network. FortiGate 7000 series provides you with the capacity of 100 Gbps NGFW throughput collective with ease of management, the 7000E series is the quickest and one of the most innovative NGFW-Next Generation Firewall solution in the industry. What are the security features covered in the FortiGate 7000 series NGFW? With the help of the FortiGate 7000 series NGFW, you can safeguard against known deeds, malware and malicious URLs using unremitting threat intelligence offered by FortiGuard Labs security services. It can help your infrastructure protection against unknown attacks using vibrant examination and delivers automated mitigation to stop pointed outbreaks. It offers industry prominent functioning and fortification for SSL encrypted traffic. It can also provide wide-ranging network interface flexibility with numerous high-speed interface modules. You can get extreme functioning VPN abilities to inter-connect on-premise data centers with hosted data center assets in hybrid cloud environment. How these FortiGate 7000E series NFGW Manages? view provides 360° visibility to identify issues quickly and spontaneously. What are the various models of FortiGate 7000E series NGFW? 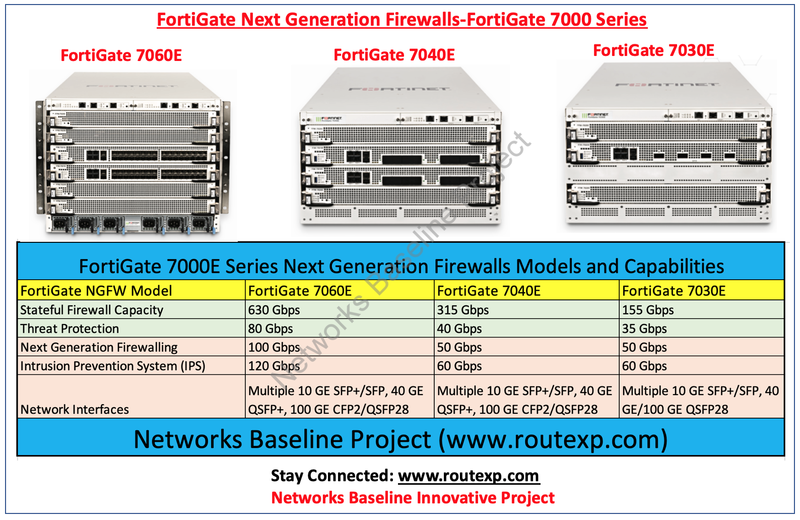 So, FortiGate 7000 Series NGFW has three different models and is categorized on the basis of the throughput and the capability. Below is the Capability for all these three models which helps enterprise to choose on the basis of the requirement on the perimeter or in the core. What are the other features of FortiGate 7000E series NGFW? Concurrent Sessions: FortiGate7060E can have Concurrent Sessions of 320 million, while other two FortiGate 7040E and FortiGate 7030E have 160 million. Firewall Policies: All models have the same capability of 200,000 firewall policies capability. IPsec VPN Throughput: FortiGate7060E and FortiGate 7040E can have 100 Gbps of IPsec throughput, while FortiGate 7030E have 40 Gbps of IPsec throughput. Gateway-to-Gateway IPsec VPN Tunnels: All models have the same capability of 16,000 gateway-to-gateway IPsec VPN Tunnels. Client-to-Gateway IPsec VPN Tunnels: All models have the same capability of 64,000 client-to-gateway IPsec VPN Tunnels. SSL-VPN Throughput: All models have the same capability of 15 Gbps of SSL-VPN throughput. SSL Inspection Throughput: FortiGate 7060E can capacity of 100 Gbps of SSL inspection throughput, while other two FortiGate 7040E and FortiGate 7030E have 50 Gbps of SSL inspection throughput.